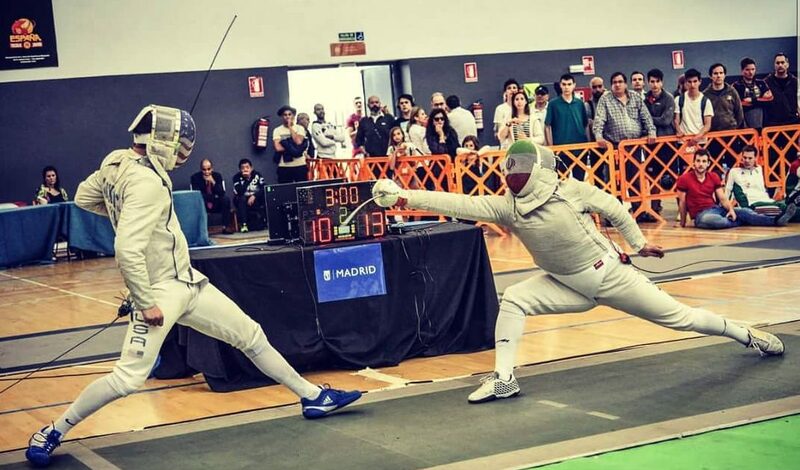 Italian sabre fencer Enrico Berre has won his first international gold medal in four years while Korea has taken out the team title at the Sabre World Cup held at Madrid’s GO Fit Centro Deportivo Vallehermoso from May 18-20. 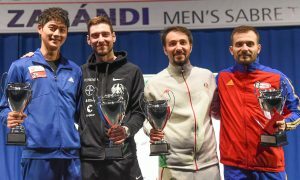 With over 200 individual fencers and 26 teams competing, Barre took on the experienced Russian left-hander and 2013 World Champion, Veniamin Reshetnikov in the final. Reshetnikov himself hadn’t won on the international circuit since a World Cup win in Budapest in the August of 2013. Barre took it 15-11 in the final, having previously overcome 2016 Olympic silver medalist Daryl Homer from the USA by the narrowest of margins (15-14) in his semi. Reshetnikov had also been forced to dig deep against Korea’s Sanguk Oh in the other semi-final. Oh was fresh from his Grand Prix win in Moscow the previous weekend, but couldn’t prevent the Russian from securing a 15-14 victory to advance to the gold medal match against the Italian. Barre was too good in that, and would have drawn confidence from his upset of another Korean, world number one Bongil Gu (15-11) in the table of 32. 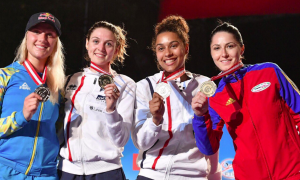 Gu had also stood on the podium the previous weekend in Moscow. In the team event the Korean trio of Bongil Gu, Sanguk Oh, and Hansol Ha was too strong, the first two gaining redemption by defeating their individual conquerors Russia in the semi-final (45-32) and then the Italians (45-41) in the final. The Italian three of Luca Curatoli, Luigi Samele and individual champion Enrico Berre had earlier beaten Hungary in the other semi-final, 45-35, but couldn’t keep it up against the Koreans, despite going ahead 15-14 after the first hand. Gu’s subsequent bouts against Barre (6-3) and Samele (5-2) proved crucial after having gone down 9-3 against Curatoli in his first. Hungary had defeated USA in the quarterfinal (45-37) while Italy beat France (45-41), Russia defeated Iran (45-32) and Korea had beaten the Germans (45-36). Russia defeated Hungary in the third-place play-off 45-35 to claim bronze.